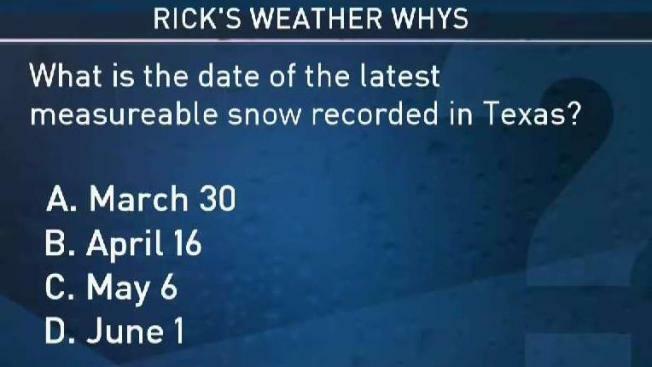 Weather Quiz: Latest Snow on Record in Texas? We wrapped up the month of March with 2.90 inches of rain at Dallas/Fort Worth International Airport — 0.59 inches below normal. Most of the rain fell last week! On March 27-28, 2.25 inches collected. The driest March ever on record was 1925: Only 0.02 inches of rain fell. Even though March saw below normal rainfall, record rains that we received in February put us at a surplus. So far this year the annual rain total is 15.06 inches, 6.79 inches above normal. With all the extra rain, drought is no longer present in North Texas. A few areas south of Interstate 20 also have abnormally dry conditions.